Assuming it’s not obvious, let me assure readers that not all design ideas are original. In fact, RETRO Innovations welcomes customer-inspired products. Let me relate the story of one such idea. The initial 2364 adapter design was trivial and joins the myriad of similar designs available online. Though it was an original design effort, I did check the design with existing online versions. Still, there is nothing particularly innovative about it. The design, though, does assume the 2364 pinout is invariant, which turns out to not be correct. 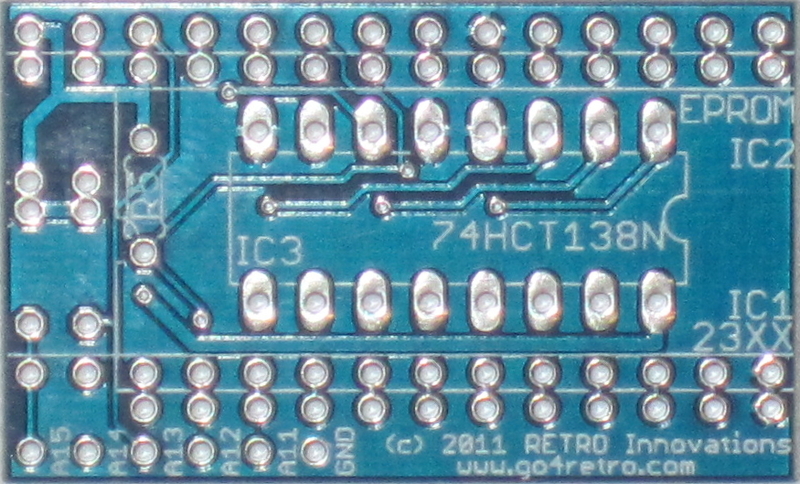 Not only can the 2364 appear in 28 pin variants, but even the 24 pin variant found on Commodore machines can occur in two different configurations. The more common variant sports a active low “select” line, while another version flips that to active high. A customer discovered this alternate variant after purchasing an adapter. Ever the resourceful one, he wired an inverter onto the select line for correct operation but suggested a new product variant for other custmers. Initially, I took the idea and implemented it by making the “select” line configurable. It’s a common trick to use an XOR gate to invert the state of a data line. Still, the resulting design felt lacking. Along the way, another customer suggested a 2332 Adapter, which uses the same 24 pin footprint as the 2364, but can arrive in 4 configurations (2 select lines). 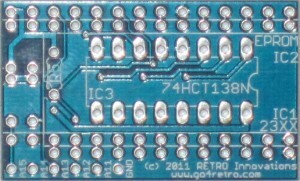 Datasheets for the 2332 also showed the 2316, which supports 8 configurations via 3 select lines. Since these are less common ROMs, they don’t get much attention in the retro market. Nonetheless, I determined that a bit of rework would allow one adapter to support any variant of 2316 or 2332, and any 24 pin 2364 variant. As the revised 2364 design required a TTL IC for signal inversion (74HCT86 XOR gate), rework required finding a TTL IC that could optionally invert and combine up to 3 select lines. As the picture suggests, the 74HCT138 supports the required function, and it often costs less than the ’86, making it a perfect choice. The cost, of course, if the need to “configure” the unit for a specific use. Solder pads must be connected according to a truth table to support a particular device. Yet, the adapter can be a time saver for those who need to quick swap out a dodgy 2316/32/64 with a known good EPROM with correct code. Though this unit can be configured to support the common case (and can be soldered up without the TTL IC in this configuration), the regular 2364 Adapter supports the majority of common uses, so we’ll still offer the original design alongside this one. Thus, I’m considering this unit as well for production. It offers some additional configuration options over the 2364 ROM-el, but retains the ease of assembly and programming of the 2364 ROM-el.